Transhumanism Paradox (Dante's Divine Comedy), Acrylic on Canvas, 200 x 200 cm, 2016. Transhumanism Paradox (Dante’s Divine Comedy), Acrylic on Canvas, 200 x 200 cm, 2016. 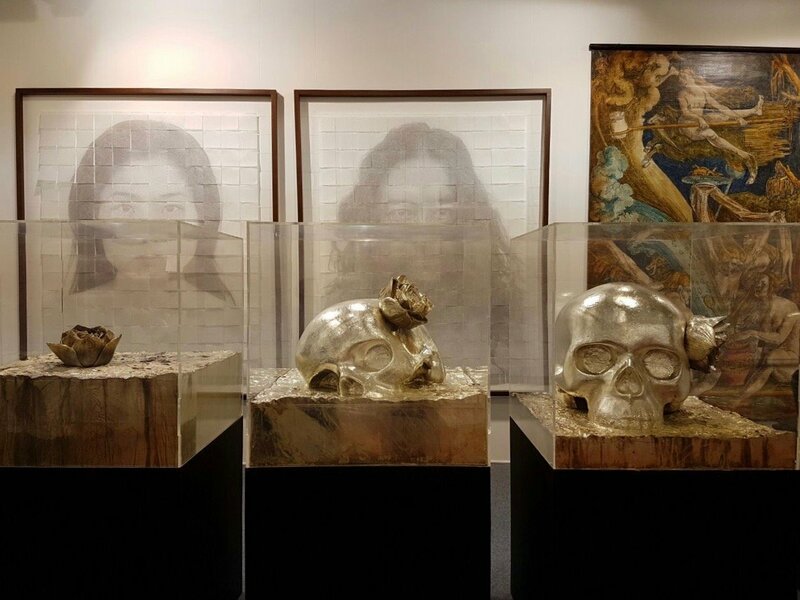 Naima Morelli explores the beautiful and mysterious work of Indonesian artist Eddy Susanto, presented at Art Bazaar Jakarta and at the Singapore Biennale. 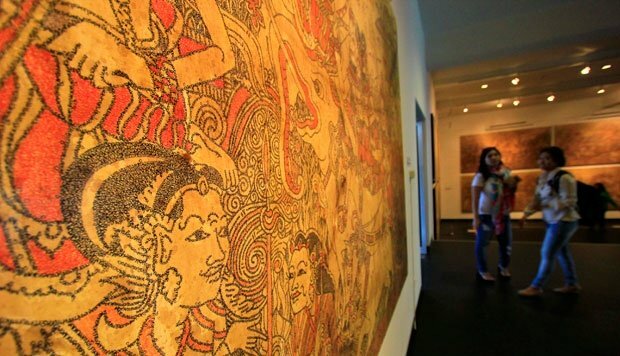 Here the artist takes on traditional Javanese mythology, Italian literature and transhumanism. His work is an opportunity to embark on an adventure into the realm of cultural meaning, across both East and West. The best artworks to collect are often riddles. While they immediately hit you on an emotional level, they might take a lifetime to navigate thoroughly. Some of their layers might be unexpected even to the artist who created them. Eddy Susanto’s work belongs to this category. Perhaps it might appear too intellectual for some. 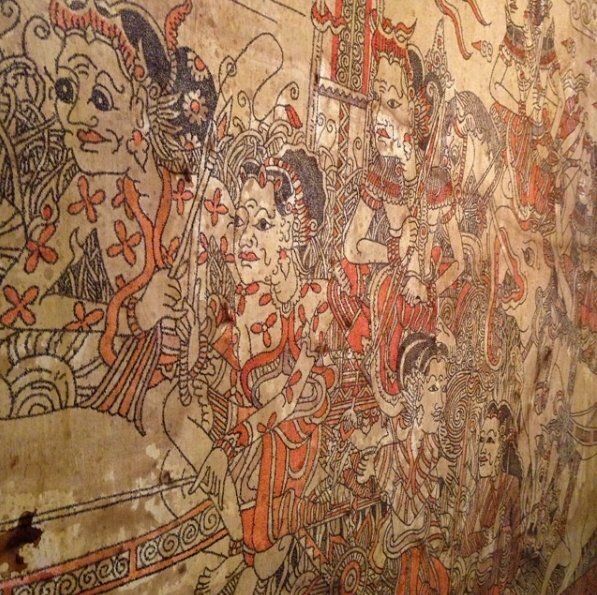 The Indonesian will be required to look back at forgotten Javanese mythology and history. The European will be asked to grasp notions buried in the depths of half-remembered literature classes. Even a professor of comparative studies would be challenged in understanding the references to worldviews from opposite corners of the planet. And yet history is not enough. The viewer must be very aware of modern challenges posed by technology, science and the market. Basically, to fully understand Eddy Susanto’s work, you are required to be Eddy Susanto. Of course, 99.999999986% of us are not Eddy Susanto. So how should we look at this artist’s beautiful, mysterious and complex work? One approach is to start with the theory, deconstructing the cultural framework behind the art with the help of curators and critics. They are there for this very reason, after all. The other approach – the one I prefer – is to abandon yourself to the immediate emotional impact: you let the image sink in and then turn to the critical readings later. We should never discount the feeling that draws us to stare at an artwork whether or not we understand it completely. The charm of Susanto’s work is the same we felt when enjoying adventure movies or books as kids. We would found ourselves attracted by the mysterious object around which the plot revolved. We knew that the object held an infinite, powerful and unexpected network of knowledge within it. We shared the protagonist’s desire to find a way to unlock it! In contemporary art, you unlock that knowledge firsthand. Exposing yourself to art means setting out on an emotional, cultural and intellectual adventure. Two recent works by Eddie Susanto are the best place to begin. 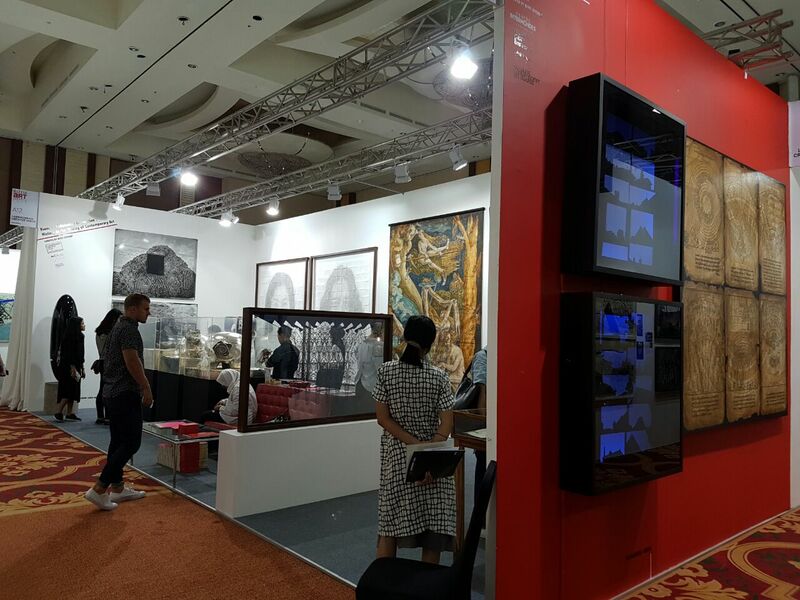 The first piece was presented by Lawangwangi at Art Bazaar Jakarta within their “French-Indonesia Connection: History in the Making of Contemporary Art” show. The second piece is a preview from the upcoming Singapore Biennale. This work features a series of six illustrations, very familiar to every Italian kid forced to read Dante’s “Divine Comedy” at school. The poem, an account of the author’s exploration of an imaginary Christian afterlife, is the most important book in Italian literature and even contributed to shaping the modern Italian language. In the text many neologisms are present. One is the verb transhumanise. This concept marks the whole “Paradise” – the third book of the three-part “Divine Comedy”. The verb is found in a verse about the incommunicability of the utter splendour which is Paradise. This concept is particularly relevant to Susanto’s artistic research, where the role of the language is central. 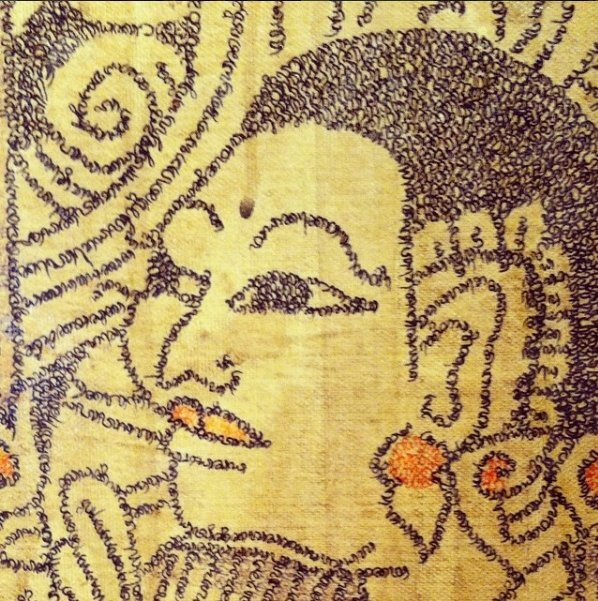 Looking at the artwork up close, you notice that the images on the canvas are formed by tiny embroidered Italian words. However, in recent times, the word transhumanisation has been associated with new ideologies. Driven by the vision of augmenting the natural capacities of human beings through the use of technology, transhumanists wants to defy aging and death. This idea is in contrast to the system conjured up by Dante, whose entire “Divine Comedy” refers to a strict order of the afterlife. 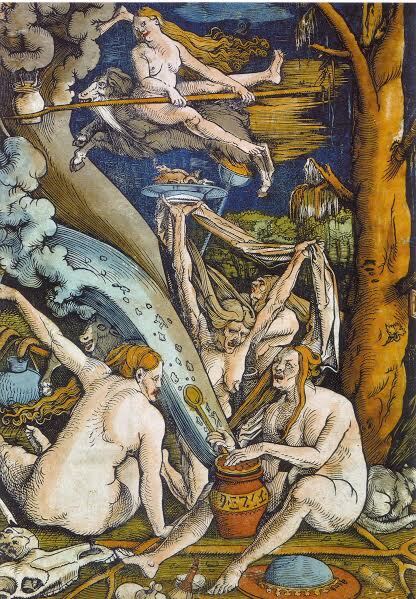 For Dante – whose self-admitted sin was superbia (pride) – it might have seemed pretty astonishing to see humans challenge divine laws. There is one more layer to the work. The background of the canvas is the central part of the US dollar, showing the so-called Eye of Providence. The symbol first appeared in Renaissance Europe, where it represented the Christian Trinity. Today some associate it with Freemasonry, which has been historically tied to the search for a higher knowledge. To the artist, however, the direct reference to the Eye of Providence alludes to capitalism, which preys on people’s fear of aging (and ultimately death) to sell beauty products and treatments. The capitalist ethos is by necessity heavily reliant on technology and science, devoid of any acknowledgment of a “spiritual” middle ground between body and brain. Within this framework, shared by many transhumanists, death is nothing more than the next problem to solve. The work of Eddy Susanto for the upcoming 2016 Singapore Biennale goes back to his roots and favourite subject: Javanese stories and mythology. 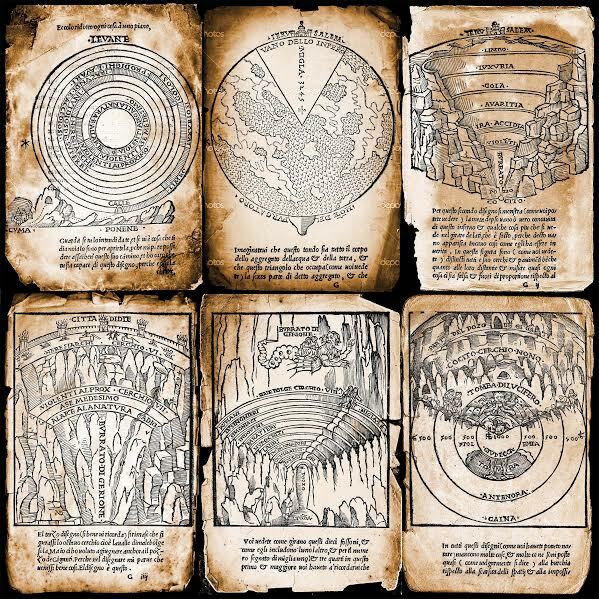 For years this body of knowledge has been mostly orally transmitted, so there has been a shortage of critical discussion of the sources outside academic circles. In this regard Southeast Asian artists are at the forefront of the re-popularisation of these stories and their presentation to the international public. In this work Eddy looks at the seminal Panji cycle, a series of ancient stories telling of the romance between Prince Panji and Princess Kirana, and Panji’s search for his long-lost bride. In its tackling of major human themes, such as love, heroism, sacrifice, politics and the search for self, the cycle conveys a philosophical and moral foundation for the improvement of the individual and of society. Yet beyond a narrative and cultural standpoint, the artist considers the stories from a linguistic perspective. The Panjii cycle originated in ancient stories from Central Java, which spread throughout the whole Ancient Nusantara region – the equivalent of today’s Southeast Asia. Their diffusion occurred through the language of kidung (song) and helped establishing it as a model of communication. In linguistic terminology Panji became a kind of lingua franca in Southeast Asia. PANJI: The Linguistic Culture of Southeast Asia is an installation with two wildly diverse parts. One is a traditional depiction of Panjii, an image from a relief in Gambyok, Kediri, East Java from about 1400 AD. On the other hand there is a book called Wangbang Wideya. This is a text by S.O. Robson, the first cohesive transcription and collection of the Panjii cycle created in the 1970s. The metaphor in the installation is to be found in transition between the media – the image becomes a book, driven by a transformation of the language itself. As in Transhumanism Paradox, looking at the figures up close reveals that they are formed by pictograms corresponding to the Javanese alphabet. Then slowly the canvas crumbles in a disintegration of tridimensional Latin metal letters, flowing into the pages of the book. The knowledge becomes (almost) universally intelligible and a “hard” object of study. In the work we witness the inevitability of images and stories becoming texts written in a foreign language in order to be preserved. In this process, something is lost in translation, including the myth’s purpose as a moral foundation. And yet the artist does not judge this process. Culture adapts to the circumstances, as long as it is important for us to keep it alive.